Well well what an eventful past 5 weeks. The Opens brings out the best and worst in our community but in this case we are solely going to focus on the amazing work and efforts put in by not only our BMA Athletes and the top WA Athletes but by all those that gave the Open a red hot crack. A massive fist pump goes out to all those that got their first Bar Muscle Up or first Hand Stand Push Up, to those that completed their first Open and those that just survived it. Well done and time to get back on the grind. Quinn Te Kahu placed 60th last year and almost halved that this year with a 34th place finish. She is extremely close to making the top 30 individuals and with possibly 3-4 girls possibly going teams this may see her make the top 30 on call back. Its going to be a finger biting few weeks but either way she will be making her second regional's appearance either way with the Injustice Crew sitting in a solid 6th place overall. Tash Bradley climbed the leader-board this year with a 88th place finish compared to 2015 114th. She has shown she is well recovered from her past injury and still a beast to be reckoned with. We cant wait to see what Tash can do when fully healed and we will be watching this space closely. Mell Hill had a Stella year climbing from 169th in 2015 to 115th overall this year. She started a new training program from Cem at Legion Strength and Conditioning late last year and since has made huge improvements. After qualifying and competing as an individual in 2013 and placing 14th overall we know this girl has the goods to keep getting better each year. Helen Harding absolutely smashed it this year and needs a round of applause. 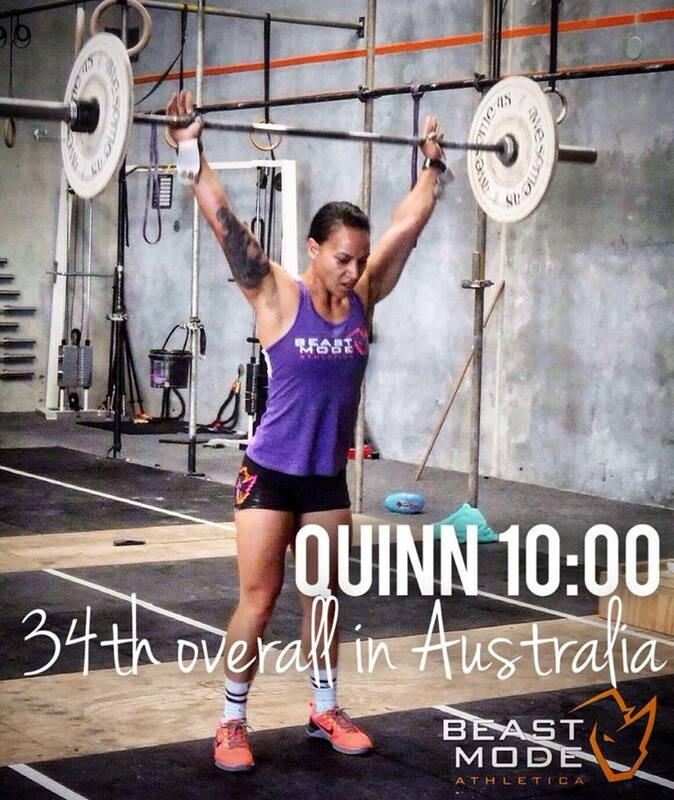 Not only did she place 4th overall in AU she placed 1st in the masters 40-45 in the WORLD!! Well done Helen and we all cant wait to see you compete at regional's. Next up Ang Kyme - one of WA's sweethearts, Ang is an OG of the WA community and she is well deserving of her 10th place overall. She has simply put in all the hard work to get where she is and it shows!! Carly Menzies makes her 3rd appearance to the regional's and since 2014 you can just tell she has been working incredibly hard on her weaknesses while still excelling at her strengths. This is her best finish in an Open so far placing 20th overall. The WA Guys were represented by Kosta Ilic and Hayden Lavanda who had a good old fight for placings this year. Kosta just piping Hayden on the last workout and securing 15th and 16th place respectively. Well done boys and well deserved. Ngarimu Ahipene needs a solid mention - sitting next at 42nd spot!! He is too far out to make it as an individual as most of the guys in the top 30 will be going teams but his improvement from 156th last years is well impressive. Good stuff Nga. Injustice take the cake for the WA teams this year sitting 6th and possibly only loosing Ryan Woodall and maybe Quinn to Individuals it should lock in there 2nd appearance. Range Of Motion sit not too far behind in 8th overall. Again with the speculation of possibly loosing Helen to Individuals their scores should still be up with the best and keep them in the top 20. Southern CrossFit 25th, Legion 30th and Team CrossFit SuperBox making a mad run for the top in 33rd. With Legion (possibly) loosing Ang and SuperBox (possibly) loosing Carly will change their score quite a bit but without the crazy stat-man on hand its far to say they maybe out of reach this year. Southern CrossFit are only 5 spots away and with the individuals scores yet to come out and the leader-board changes yet to be made this will be a nail biting next few weeks for them to see if they made the cut. Finally just a huge congrats to all those again that not only made it but participated. You guys are all #SUPERHUMANS and we looking forward to catching up with everyone at the next comps. Posted on March 31, 2016 by Tara ORourke and tagged Fitness CrossFit Open Beast Mode Beast Mode Athletica.